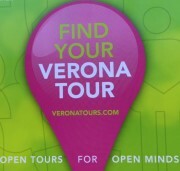 VERONA CITY TOUR A cosy Italian city, with stunning Roman remains and a delightful, energetic atmosphere. Come and see an unexpected city! "I didn't expect Verona to be so beautiful! ": this is what 90% of our travelers say at the end of the tour. Join our walking tour starting at the windy river bank of Ponte scaligero and going through the old Roman Borsari gate and to Piazza Erbe, the beating heart of the city. Next to it the classy Piazza dei Signori, a sort of elegant lounge boasting palazzi from the XII to the XVII century.We don't forget the Arche scaligere, monumental graves of powerful Medieval landlords. In the Capulets' house, instead, we ponder why Juliet is so immensely more popular than Romeo and we learn what the Juliet's Club is. At the end of the tour, a “wow” moment: imposing, almost intact, solemn and at the same time alsolutely welcoming, the arena is a Roman Amphitheatre, the best preserved in the world and... we could not immagine our city without her! This is an outdoor tour. We don't enter any monument. Children are free of charge up to 14 years of age. Teen-agers over 14 years are charged full price.